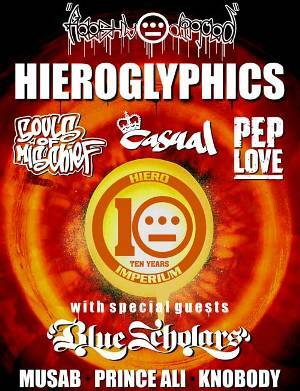 It’s been a little over ten years since Del, Souls of Mischief, Casual and producer Domino launched Hiero Imperium. So this summer, the crew will celebrate with the Freshly Dipped Tour, a summer-long trek through North America. Other treats to look out for include a new album from Souls of Mischief’s Opio, Vulture’s Wisdom, Vol. 1, set for release in July; a commemorative seven-inch single featuring Hiero and Blue Scholars; and the premiere of the collective’s new Hiero Jeans. “We are putting this tour together to thank our fans for their years of loyal support, expose them to our new projects including our brand-new lifestyle line, Hiero Jeans, and to celebrate the ways that hip-hop style has influenced the fashion world,” says Tajai from Souls. He replaced Domino as Hiero Imperium’s CEO in 2006. The Freshly Dipped Tour promises lots of good hip-hop, but Del will be missed. Hopefully he’ll make it out to some of the dates. In the meantime, check out the current itinerary; as usual, I’ll update when more information becomes available. This entry was posted in News and tagged Blue Scholars, Casual, Hieroglyphics, Knobody, Musab, Pep Love, Prince Ali, Souls of Mischief, Tanya Morgan. Bookmark the permalink.